The United States Congress designated the West Chichagof-Yakobi Wilderness (map) in 1980 and it now has a total of 273,098 acres. All of this wilderness is located in Alaska and is managed by the Forest Service. 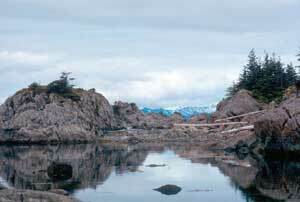 This wilderness occupies the western portions of Chichagof and Yakobi Islands in the extreme northwest portion of the Alexander Archipelago of Southeast Alaska. The wilderness is administered by both the Sitka and Hoonah Ranger Districts. Chichagof Island and, just to the north, smaller Yakobi Island, were named for a Russian admiral and a general, respectively. The western shore opens on the Pacific Ocean, with miles of dramatic wave-pounded cliffs, but many sheltered bays and islands offer safe harbor. Western hemlock and Sitka spruce forests cover approximately 1/3 of the area, with muskeg, alpine, and estuarine vegetation making up the rest. The diminutive Sitka black-tailed deer is common here. Brown bears are frequently sighted, along with an abundance of smaller furbearing animals. Migratory waterfowl frequent West Chichagof-Yakobi in remarkable numbers, and marine mammals including sea otters, sea lions, and seals can be seen. Long before the Russians came, Tlingit Indians began utilizing this area for its rich natural resources. The village of Pelican lies only a short distance from the Wilderness boundary. Mined for its gold, Chichagof produced almost a million ounces of the yellow metal. Some evidence of old operations persist to this day. The U.S. Forest Service maintains four rental cabins in the wilderness. Wilderness camping is also allowed. Planning to Visit the West Chichagof-Yakobi Wilderness? How to follow the seven standard Leave No Trace principles differs in different parts of the country (desert vs. Rocky Mountains). Click on any of the principles listed below to learn more about how they apply in the West Chichagof-Yakobi Wilderness.